Sports Ethics For Sports Management Professionals 1 Edition Sports Ethics For Sports Management Professionals Provides Students With The Necessary Tools To Make Ethical Decisions In The Sports Management Field. It Presents Several Ethical Models That The Sports Management Professional Can Use As A Platform To Make Ethical Decisions. 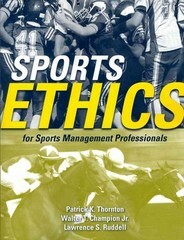 Directed At Future Sports Executives And Sports Managers, The Book Contains Numerous Case Studies Which Allow Students To Apply The Ethical Decision-Making Process To A Sports-Related Ethical Dispute.